It’s been a long time since foreign leaders arrived on our shores saying that America is the future—so long, in fact, that when it does happen, we don’t know what to make of it. For me this was the most interesting subtext of Russian president Dmitri Medvedev’s visit to the States last month. He and Barack Obama had a familiar discussion of shared national interests, from arms control to ethnic peace in Kyrgyzstan. 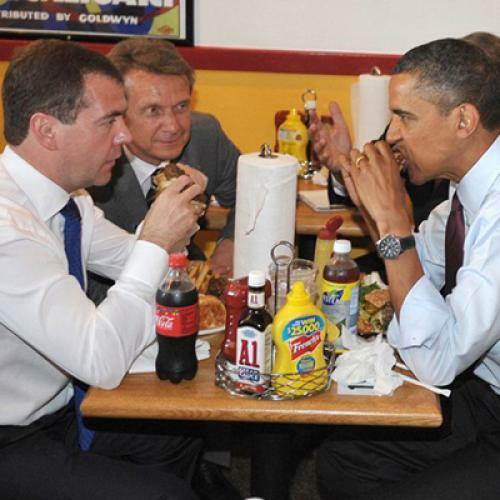 Their lunch outing to an Arlington burger joint reflected the search for good visuals that we often see when a summit itself isn’t generating much real news. And in his side-trip to Silicon Valley Medvedev was doing exactly what most visiting politicians try to do—pitch their country to American CEOs as a good place to invest. Now the president of Russia has gotten a reputation as a big talker who doesn’t always deliver. And he may not even be president two years from now, if his old pal and patron (and now prime minister) Vladimir Putin wants the job back. All the same, it’s worth paying close attention to what Medvedev is saying, because he is defying the conventions of Russian politics. For twenty years, wanting to be like the West has been a guarantee of utter electoral irrelevance. Once you were tarred with the Western-groupie brush, you didn’t recover. Everybody in the business is supposed to understand this, not least because Putin made it a central theme of his second term as president, before turning things over to Medvedev. Russia, he said, no longer had to take lessons or accept criticism from the West. One of his advisers came up with a slogan—“sovereign democracy”—to express this idea, but Putin put the point more crudely. Anyone who judged Russia by Western ideas of progress had, he suggested, been to too many European embassy cocktail parties. Putin has not abandoned his exceptionalist themes just because Medvedev uses different ones. When somebody criticizes what’s happening in Russia, the prime minister’s go-to defense is that things are even worse elsewhere. He advises his domestic opponents to stop bad-mouthing their own country. And he does it with genuine polemical flair. Take his performance at a recent luncheon with members of the St. Petersburg arts crowd. They were whining to him about plans to build a huge eyesore of an office tower as the headquarters of Gazprom, the state natural-gas monopoly. Did Putin respond to these complaints, which were laced with familiar comments about unresponsive bureaucrats and official corruption, by promising to look into the matter? Did he call for transparency in making such decisions, so that all viewpoints could be heard? In Russian politics, Mevedev has come to stand for ineffectual high-mindedness. If the past is any guide, all his talk about America as a model will only compound his image problem. In this light, his chances of serving a second term don’t look too good. And yet it’s just possible that the president of Russia understands the current political moment better than we do. He seems to have concluded that the old formulas are played out, and that the country needs–even wants–something new. Putin has assumed that a Russia that was back on its feet would be comfortable standing apart from the West. Medvedev’s message, by contrast, is that Russia should feel comfortable joining in–and, even more, trying to measure up. He’s gambling that America, and politicians who want to learn from America, can seem cool again. When foreign political leaders say things that we don’t immediately understand, Americans often shrug them off as intended for domestic consumption. In Medvedev’s case, that would be the most encouraging interpretation of all.